four × = twelve Required Please enter the correct value. 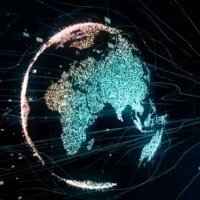 Urgent Update from Michael Robinson: The job market isn’t the only sector on the brink of transformation… currency has been evolving rapidly as technology marches forward. In fact, Amazon just received a shocking patent verdict that could have HUGE implications for Bitcoin. Even though Amazon’s 100 million-plus members can’t purchase with cryptocurrency yet… I expect that this retail giant foresees a day in the very near future when customers could use Bitcoin and other cryptos to make fast, secure payments. If you make the right moves now – before this sparks an unprecedented buying frenzy – you could make millions. Go here to see how before you miss your shot. That’s how one man described the coming impact of artificial intelligence (AI) and automation on humankind. This wasn’t some tinfoil hat-wearing conspiracy theorist. It came from Jack Ma – the man behind one of the most meteoric rises in modern corporate history. Ma, founder and chairman of Chinese e-commerce powerhouse Alibaba Group Holding Ltd., said it while speaking in a prestigious slot at April 2017’s World Economic Forum in Davos, Switzerland. You should be listening to him. You see, if you or a member of your family is working and earning between $40,000 and $80,000 a year, you have reason to be worried. And if you or someone you love makes less than $20 an hour, you should be terrified. According to recent White House report, there’s a 1-in-3 chance that workers in that first group will be replaced by robots and AI in the next few years. 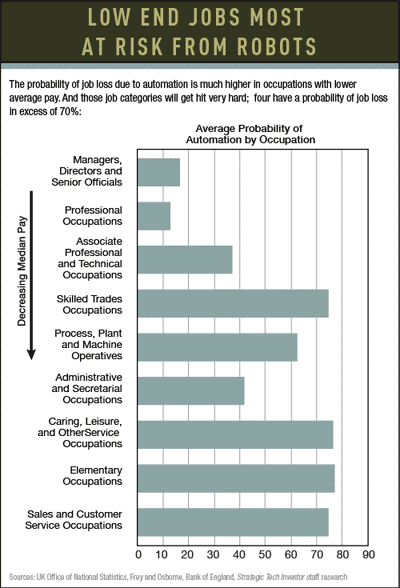 And if you’re in that second group, it’s even worse: Those folks face 8-in-10 odds of losing their job to an automaton. The White House and Ma are far from alone in predicting this threat to our very way of life. The World Economic Forum, in a report out of the Davos 2016 meetings, predicts AI and robotics will cause 7.1 million job losses by 2020 in the world’s top 15 economies. The United Nations’ International Labor Organizationsees an increase in global unemployment of 11 million in the next four to five years. In a recent interview, AI expert James Barrat told me that what we’re about to see is unlike any of the innovations we’ve seen before. Bitcoin 101: Everything you need to know right now. If you had followed my advice in 2013 and invested in Bitcoin, you’d be 25,351% richer right now. Exceptional, yes, but I expect another record-breaking Bitcoin rebound could be coming… all thanks to an under-the-radar event expected to completely rock the crypto world. Learn more now. “In history, technological advancement has not yielded a net loss of jobs. It never has,” said Barrat, a documentary filmmaker and author of the 2013 book Our Final Invention: Artificial Intelligence and the End of the Human Era. “AI is different. In history, innovation comes along in a kind of plodding way, and the cotton gin hits and revolutionizes an industry and displaces a bunch of workers – but they get retrained. AI, robots, and automation are going to be in every industry. That’s why – first and foremost – I’m shoring up my own family’s finances and encouraging my daughters to pursue “AI proof” careers. Second, I’ve prepared this report – for you. Most people will likely survive this Jobless Future – whether through scraping together enough “gigs” to put food on the table or through measly government handouts. But to me, mere survival isn’t good enough. And I bet you feel the same way. You want to thrive during the Jobless Future. But first, let’s take a look at this technology – and just how quickly it could change the world. And those alarming time frames might be optimistic. In a recent report, consultants at McKinsey contend that existing technology, including AI, could automate 45% of our paid work today. 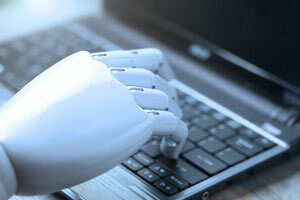 AI refers to the development of computer systems capable of performing tasks that normally require human intelligence (visual perception, speech recognition, decision-making, translation). AI will usher in changes in how we drive, shop, search the web, manage our productivity, discover medical advances and manage our personal lives. The Siri voice-bot from Apple Inc. and the self-driving cars being developed by Alphabet Inc.are examples of AI technology you’ve likely seen or read about. According to Tractica.com, the entire AI industry generated just $200 million in direct revenue in 2015 – but will grow by some 55-fold in roughly the next nine years. And that explains why Silicon Valley leaders have been moving heavily into AI over the past few years – and why we want to do so as well. In healthcare, AI helps diagnostic systems spot disease much faster and biotech companies search for new compounds. Banks are using AI to strengthen their credit-scoring abilities. And leading websites are using AI to enhance fraud detection and improve product recommendations. AI’s original missions – image classification, speech recognition and language translation – are all becoming much sharper as well. A tiny company’s game-changing device has been approved by the FCC… and it’s set to spark the most monumental technological transformation you’ll ever see. This is the only device of its kind to receive this historic approval, and the floodgates are set to open any minute. With one tiny company at the heart of this revolution, even a small stake could reward you with astronomical gains. You need to hurry if you want to find out how to take advantage of this ground-floor profit opportunity. Indeed, AI is set to take off because the costs of computing and data storage are both plummeting, while the computational capacity of today’s processors continues to soar. At the same time, software engineers have made a stream of advances in sophisticated algorithms that are turning abstract concepts into tangible AI tools. Those analysts at Tractica figure that AI will be an $11.1 billion business by 2024. That works out to 56% compound annual growth from 2015 levels. To make that happen, heavy investments are taking place right now. According to the Machine Intelligence Research Institute, as much as 10% of all computer science research and development is now focused on AI. And big tech firms are hunting the industry’s advanced startups. There were more than 300 deals in the AI field in 2015, according to CB Insights. Apple, for example, made an important AI acquisition that’s set to boost Siri’s prowess. Emotient Inc., which Apple acquired in January 2016, has pioneered facial-recognition technology that detects a wide range of emotions. The system measures customer engagement to determine an ad viewer’s feelings about what’s being pitched. It also helps doctors measure pain levels in patients unable to express themselves. Founded in 2012, Emotient mostly sells its tech to marketers, advertisers and companies that want to know more about their customers. Look for Apple to integrate Emotient into Siri, as well as dashboard interface CarPlay and its own marketing efforts. Few companies are tackling AI as aggressively as Alphabet. In January 2014, the company spent $400 million to acquire British AI company DeepMind Technologies, which at the time employed 12 or so of the top 50 AI thinkers in the world. The assembled talent is getting a helping hand from the legendary computer scientist and futurist Ray Kurzweil. He joined Alphabet team in 2012 after a four-decade career of inventing a set of AI breakthroughs. There are a number of ways that AI can enhance Alphabet’s existing businesses. Look for Google.com itself to become an advanced computing engine that can assess images, text and sound in deeply contextual ways. This so-called reinforcement learning involves getting computers to learn about the world even from very limited feedback. Alphabet’s various “moonshot” divisions are now applying AI toward robotics, longevity treatments and those self-driving cars. When Facebook Inc. bought virtual reality (VR) firm Oculus Rift for $2 billion in the summer of 2014, few people made the connection to AI. But by late 2015, the connection became clearer. In November, Oculus announced breakthroughs in using VR to identify objects in photos, understand natural language, make predictions and create decision trees. Facebook’s engineers clearly envision a future in which VR doesn’t simply present a pre-written set of computer code, like today’s video games. 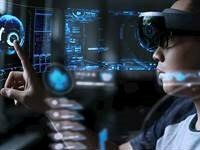 Instead, VR will be able to think for itself and eventually create environments and interactions that are every bit as real as the world around us. Now, put that into a social-media space, where you and your friends interact. You can see what’s on the mind of Facebook engineers. CEO Mark Zuckerberg has become a key cheerleader for AI at Facebook. In a Jan. 3, 2016, Facebook post, he noted that he will be taking a deep dive with the technology. “It’ll help me visualize data in VR to help me build better services and lead my organizations more effectively,” he said. Elon Musk, founder of Tesla Inc. and SpaceX, is just one of many tech leaders who have cautioned the world about the dangers of AI. In January 2015, Musk joined a team of scientists, researchers and academics – including Hawking and Apple cofounder Steve Wozniak – in issuing a collective warning. In an open letter presented at the International Joint Conferences on Artificial Intelligence, they said a military AI arms race could soon develop if preventative measures are not taken as soon as possible. Somewhat counterintuitively, since then Musk has teamed up with Y Combinator tech incubator founder Sam Altman to create billion-dollar nonprofit OpenAI… and then sharing its technology with everyone. Giving away AI tech actually helps Musk compete against the likes of Alphabet and Facebook. Opening the tech up to everyone means that advances can come anywhere, not just OpenAI researchers. And it helps Musk lure idealistic scientists from his competitors and jump-start AI development for Tesla’s inevitable self-driving cars. You’re already seeing this “sea change” happen. Consider all those self-checkout lines at hardware and grocery stores, restaurants, and sandwich shops. More and more often, you’re plugging your order into an electronic kiosk and getting what you need with fewer people (i.e., jobs) involved. Or maybe you worked at an auto plant where robots replaced workers on the line. That’s AI and automation at work. That said, we’re not talking about a world-ending scenario here. Like I said, we’re going to survive this. And the bleakness of the Jobless Future doesn’t change that. You can thrive from here on out by profiting handsomely from the very AI technologies that are threatening humanity’s livelihood. These rapidly developing technologies may be decimating the globe’s work force, but they’re also investment opportunities. With that in mind, I’ve dug up three ways you can “play” the Jobless Future to create an outrageous fortune for yourself and the generations that will follow. Most investors would laugh at the notion that pizza delivery is pushing the boundaries of artificial intelligence (AI). After all, it’s a pretty simple business: take dough, add toppings, bake, insert in box and drive to the customer’s address. And yet, Domino’s Pizza recently launched a high-tech pilot project that underscores how AI will shakeup a global car market that IBIS World says is worth $9 trillion. It also could lead to mass layoffs and dislocations among the roughly 15 million professional delivery drivers in the U.S. alone. Turns out that Dominos recently launched a pilot project in New Zealand with a specialized robotic delivery vehicle. Dubbed Domino’s Robotic Unit, it’s just under 3 feet high and has a heated container that holds up to 10 pizzas. Battery powered, the DRU uses sensors to find its way and can deliver within 12.5 miles of a store. This is just the start for AI-controlled autonomous vehicles (AVs). Simply stated, you can’t have true driverless vehicles without some form of AI. The entire idea behind this technology is to replace human drivers. To do that, you need a bevy of tech platforms that include GPS, chips, sensors, radar, cameras, firmware and software. And the machine needs to be able to take all that data coming from inside and outside the vehicle and use it to make smart decisions in real time. At present, there are no true AVs being sold in the United States. But Alphabet Inc. has fielded a fleet of robotic cars that have logged a combined 2 million miles in roughly the last four years. And Uber Technologies Inc. is testing driverless vehicles in Pittsburgh. IHS Automotive forecasts annual sales of vehicles with self-driving features and true AVs hitting 21 million units within 20 years. That should make a huge dent in auto accidents, which kill 32,000 people every year just in the U.S.
And this shift also will have a profound impact on the market for delivery drivers. In the U.S. there are roughly 1.8 million long haul truckers. Local delivery drivers total roughly double that. Add in related fields like forklifts, bus, and food deliveries and you get to as many as 14 million drivers. On that journey from San Francisco to New York, the car had to guide itself through big-city rush hours, road construction, confusing street signs, and diverse weather. Throw in careless human drivers and you are really putting AV tech through its paces. A human driver had to step in just twice on the trip. During the other 99% of the time, he could just as easily been asleep at the wheel. A few quick after-trip software fixes have been made, so the next cross-country trek could be truly 100% hands-free. Yes, Audi got a lot of media buzz around the trip. But really, beyond supplying the car, it played a pretty small role in the AV systems themselves. 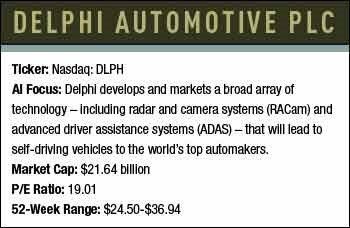 All the work needed to make that trip a success goes to Delphi Automotive PLC (Nasdaq:DLPH), a tech-driven supply firm. This auto supplier will give you a broad reach in the fast-moving field of self-driving cars. It now counts General Motors, Ford, Volkswagen, Hyundai, Volvo, Fiat-Chrysler, and Daimler as clients. Delphi cuts its teeth by selling advanced cruise-control systems. Each year, those systems get even better. Now you know why Delphi has more than doubled the number of software engineers over the period to 5,000 – 26% of its science staff. The firm also wants to kick-start demand for its Radar and Camera System (RACam). The approach combines radar and vision sensing as well as data fusion in one platform. Consider that Delphi is already a leader in the $15 billion market for advanced driver assistance systems (ADAS). These provide such features as collision and adaptive cruise control as well as blind-spot and lane-departure warnings. Here’s Delphi’s 10-year plan. Take ADAS and turn it into a semi-driverless car system by 2020 and into a system for fully autonomous driving by 2025. Buying young tech upstarts is a big part of those growth plans. In October 2015, the firm bought Quanergy, which makes laser systems. That same month, it acquired Control-Tec, a builder of auto data analytics tools. Those deals came right on the heels of a buyout of Ottomatika, which specializes in self-driving software. Add it all up, and you have a supply firm set to profit from the growth in AI-guided cars over the long haul. Over the past three years, Delphi has grown per-share profits by an average 11%. But after a 2016 round of cost-cutting and new sales, earnings could grow by at least 15% this year. At that rate, profits will double again – and so will your gains – in less than five years. With a $26.68 billion market cap, the stock accelerated from $67.35 at the onset of 2017 to a recent high of $83.23 in mid-March. I’m thinking it could get to $100 within 12 months – and because Delphi has slipped back some since its recent high, you’re at a very advantageous “Buy” point. Even before its release, the new Optane-branded SSD product from Intel Corp. fast became the talk of the tech press. Test releases showed unheard speeds for similar drives available to consumers. But when Intel wanted to make such a project a reality, it had to bring in knowhow from elsewhere, a much smaller yet brilliant company. Memory devices store dynamic data to make computers run faster and more smoothly. This is what allows you to open multiple windows on your web browser while you are working on a document, editing photos, adding graphics to a presentation, and all the while streaming music in the background. However, most investors would think of chips, sensors, and computers as the mind behind it all. And yes, all of these components are crucial for this field. But you see, without an ace memory platform, all these computing breakthroughs will find themselves blocked. In other words, you’d be trying to put a fire hose of data through a straw. To run at its full potential, AI needs memory hardware as much as perhaps anything. 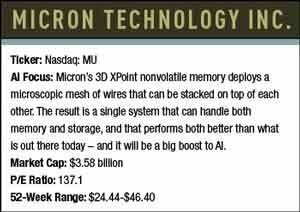 When I think of companies scaling that wall, Micron Technology Inc. (Nasdaq: MU) always comes first. Micron shocked the tech world in 2015 with a huge breakthrough called 3D XPoint. The platform ushered in an entirely new way of looking at memory.Standard flash systems rely on transistors to store data. But 3D XPoint (pronounced “cross-point”) deploys a microscopic mesh of wires that can be stacked on top of each other. These layers give memory its third dimension. The result is a single system that can handle both memory and storage, and that performs both better than what is out there today. It’s “nonvolatile” (NAND) storage, meaning it holds onto its data even when the power is off. And it runs 1,000 times faster than today’s non-volatile flash memory approach. Micron’s 3D XPoint is the technology powering Intel’s Optane. I find it telling that Micron is working on this with a mega-cap firm that has remained at the sector’s forefront for decades and is currently the world’s largest producer. It’s a big deal. Intel’s operating cash flow of is in the same ballpark as Micron’s total market cap. The partnership is a great fit for Micron. But it’s not the only focus at Micron these days, nor is it the only place where XPoint is being used. Most People Don't Know This About Bitcoin: A systems upgrade expected any day now could send Bitcoin to $100,000. Go here to see why Bitcoin's not dead… and how it could make you millions. Patrick Moorhead, president and principal analyst at Moor Insights & Strategy, believes XPoint could be a big boost to AI. To put it all in context, just look at what’s up for grabs in Big Data alone. SNS Research says business will invest $40 billion in Big Data systems this year. With spending set to rise by 14% a year through the end of this decade the sector will be worth $67.5 billion. If memory just grabbed 2.5% of that total, we’re talking a market worth nearly $1.7 billion. And these may actually be too conservative estimates. Micron boasts the world’s broadest lineup of memory products, with more than 20,000 patents and operations in more than 20 countries around the world. Since the beginning of this year, Micron’s stock has jumped from $21.92 at the end of 2016, just days after hitting its record price, to $26.83 per share. And it won’t take long for it to hit triple-digit gains. In fact, I think we could see 70% gains in less than a year and a half. President Donald Trump promises to create 25 million new jobs over the next decade with his economic plan. That plan is a good one – and will be very good for tech companies and their investors. However, robotics and AI will eliminate tens of millions of jobs over that same stretch. It makes many of us planning our retirement – trying to put together enough money and investments to guarantee that our “golden years” are prosperous – wonder how we’ll do it. Moreover, it makes us worry about our children’s and grandchildren’s futures. How can anyone save or invest if they’re looking at a Jobless Future? As we’ve been saying, one way to do it is to profit from the very automation technologies that are threatening humanity’s livelihood. And to do that, you have to “pick” the best stocks in this sector. I’ve just spotted such a company – one whose technology could to displace millions of “back office” workers in the coming years. You know, the folks doing data entry and handling the customer service lines. Its technology is known as robotic process automation (RPA). And its shares are primed for quick 50% gains. RPA uses software robots to replicate the actions of human workers for such tasks as data entry and customer service. RPA systems can dramatically improve the productivity of existing software applications across the board. Companies that invest in this technology can supercharge the software tools they already own, giving them a nearly instant return on investment. Researchers at Gartner call this a “gateway” technology and say it will affect a wide range of software systems – everything from logistics and resource planning to customer relationship management. It’s one of the fastest-growing segments of the $3.4 trillion global IT market, according to Gartner. And the field has already shown the ability to grow at 20% to 30% per quarter. 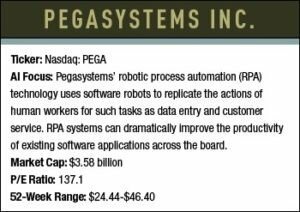 Pegasystems Inc. (Nasdaq: PEGA) wanted to jump to the top of the head in this space. So, in April 2016, it acquired RPA industry leader OpenSpan. Founded in 2004, OpenSpan reported that its RPA tools were running on more than 200,000 desktops at leading firms around the world around the time Pegasystems gobbled it up. Identify workflow inefficiencies: As a first step, businesses can quickly and more easily analyze their employee workflows to uncover hidden areas that mar the customer experience, such as error-filled apps and forms. Automate desktop processes:Human agents suffering from “app overload” can now benefit from desktop applications operating in a single seamless process experience, improving customer service. Reduce repetitive tasks:Many high-volume, low-complexity tasks traditionally done by employees can now be automated without the need for human intervention. The buyout rendered Cambridge, Mass.-based Pegasystems the single best way to play RPA’s disruptive impact and ride huge sales growth. Pegasystems stock price on the day it announced the acquisition (April 12, 2016) was $24.32, not far off its record. Exactly one year later, it traded at $44.50 per share. The market cap has also surged, up to $3.45 billion. Granted, investors already liked Pegasystems because its software targeting customer service and predictive analytics. Pegasystems has managed to involve itself in every major industry, including healthcare, finance and insurance, energy, manufacturing, and media. And its elite customer base includes most of the Global 500. The company is on a 10-year streak of delivering double-digit sales growth while consistently beating forecasts. But it’s never experienced a stock-price surge like this last year. And that surge is far from over. You can expect 25% gains in the next year – and triple-digit gains to follow not long after. There you have it… three strategic ways you can bolster your future in anticipation of time when 9-to-5 gigs are a precious rarity. Instead of cowering before what tech billionaire Elon Musk calls “our biggest existential threat,” we’ll be making building our fortitude – and our fortunes. Get in on these plays now. Bitcoin critics scoff at price predictions of $50,000, $100,000, and higher, because they claim cryptocurrency "has no value." But the many applications of Lightning technology will have tremendous economic value worth billions. Lightning will spawn a wave of cryptocurrency innovation akin to what has happened with the web. And it's not even the only source of Bitcoin value. Today, it's also seen as a store of value, a "digital gold." And the underlying blockchain technology, while only a peripheral part of Lightning, has multiple uses of its own. This dynamic combination of catalysts is why Fundstrat Global Advisors co-founder Tom Lee has a 2018 Bitcoin price target of $25,000. John Pfeffer, a London-based entrepreneur and investor who served as a partner at private equity firm Kohlberg Kravis Roberts for 11 years, thinks Bitcoin could reach $75,000 by the end of the year. And I believe the Lightning Network will push Bitcoin to $100,000. My target is so high because I’ve seen a catalyst in Lightning hardly anyone is talking about. This single event could launch "the biggest windfall-profit bonanza the digital currency world has ever seen."